Synthetic peptide within Human p95/NBS1 aa 650-750 (C terminal). The exact sequence is proprietary. WB: HeLa and Jurkat cell lysates. IHC-P: Human testis and skin carcinoma tissues. ICC/IF: HeLa cells. Flow Cyt: HeLa cells. Our Abpromise guarantee covers the use of ab32074 in the following tested applications. WB 1/1000 - 1/10000. Predicted molecular weight: 85 kDa. For unpurified use at 1/1000 - 1/2000. Ubiquitous. Expressed at high levels in testis. Defects in NBN might play a role in the pathogenesis of childhood acute lymphoblastic leukemia (ALL). 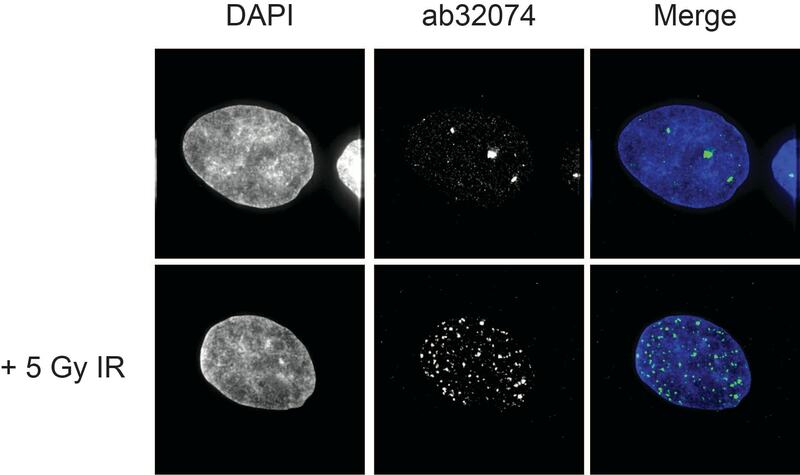 The FHA and BRCT domains are likely to have a crucial role for both binding to histone H2AFX and for relocalization of MRE11/RAD50 complex to the vicinity of DNA damage. The C-terminal domain contains a MRE11-binding site, and this interaction is required for the nuclear localization of the MRN complex. The EEXXXDDL motif at the C-terminus is required for the interaction with ATM and its recruitment to sites of DNA damage and promote the phosphorylation of ATM substrates, leading to the events of DNA damage response. Phosphorylated by ATM in response of ionizing radiation, and such phosphorylation is responsible intra-S phase checkpoint control and telomere maintenance. Nucleus. Nucleus, PML body. Chromosome, telomere. Localizes to discrete nuclear foci after treatment with genotoxic agents. 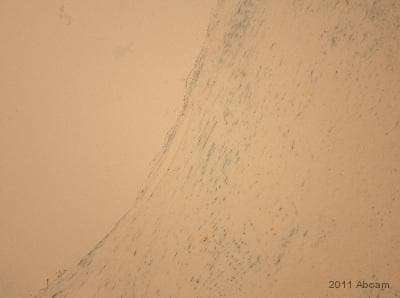 Immunohistochemistry (Formalin/PFA-fixed paraffin-embedded sections) analysis of human testis tissue labelling p95/NBS1 with purified ab32074 at 1/200. Heat mediated antigen retrieval was performed using Tris/EDTA buffer pH 9. A prediluted HRP-polymer conjugated anti-rabbit IgG was used as the secondary antibody. Counterstained with hematoxylin. Immunohistochemistry (Formalin/PFA-fixed paraffin-embedded sections) analysis of human testis tissue labelling p95/NBS1 with unpurified ab32074 at 1/20. Heat mediated antigen retrieval was performed using Tris/EDTA buffer pH 9. A prediluted HRP-polymer conjugated anti-rabbit IgG was used as the secondary antibody. Counterstained with hematoxylin. Publishing research using ab32074? Please let us know so that we can cite the reference in this datasheet. I am happy to confirm that the concentration of lot GR4228-7 is 0.645 mg/mL. The IgG produced by rabbits have greater affinity and greater sensitivity than mouse IgG (about 100-1000 fold) and at the same time the total amount of IgG produced by the rabbit hybridomas is generally lower than in mouse hybridomas. Many 'veteran' antibody users are generally familiar with the IgG amount provided from mouse antibodies and can judge how many reactions they may get or need to use based on concentration. Unfortunately, this experience is not transferable to rabbit monoclonal antibodies because the concentration scales are generally very different. Since the specificity and sensitivity is much higher with rabbit monoclonal antibodies, less IgG is required per reaction. I would like to reassure you that while the amount of IgG may not be comparable to mouse monoclonal antibodies, customers are receiving a comparable number of reactions/tests/blots/stainings per tube. I hope this information is helpful. Please do not hesitate to contact me with any further questions in this matter. what is the concentration of Anti-p95 NBS1 antibody [Y112] - ChIP Grade (ab32074) lot GR4228-5? The concentration of ab32074 lot GR4228-5is : 0.645 mg/mL. Batch variability in ChIP. Would like to replace vials from alot that did not work well in ChIPwith vials from adifferent lot. Thank you for your call today and for keeping me updated about this situation. I am sending the three vials thatwe havein stock. These vials will be arriving on the free of charge order 1060035, and I expect them to arrive tomorrow. I've also issued credit note***for one vial of ab32074. The full purchase price will be refunded back to your credit card pending approval from our accounting department. If you have any questions about this credit note, please contact mailto:us.credits@abcam.com. I apologize again for the batch variability of this antibody. Please let me know if you have any questions or if there is anything else that we can do for you. A user needs a information about positive control tissue p95 NBS1 antibody [Y112] (ab32074). It is stated that Human skin carcinoma as positive control tissue on the datasheet. But It isn't clear which types of skin cancer. Could you please clear that? I can confirm that p95 NBS1 antibody [Y112] (ab32074) was tested onsquamous cell carcinoma of the skin. This would be a suitable positive control. 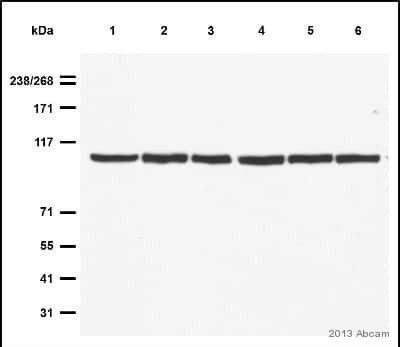 What is the concentration of this antibody, lot #GR50908-2? The concentration for ab32074, lot #GR50908-2 is *****mg/mL. Lot GR4228-7 showed enrichment for negative control gene with mouse lymphocyte samples. Is lot GR50908-2 better for ChIP? Thanks for your call today and for letting us know about the trouble with ab32074 in ChIP. As we discussed, I am sending a free of charge vial of ab32074 from lot GR50908-2 on the order ***, which should arrive tomorrow. So unfortunately I don't have any data for each of these lots in ChIP, but I am hopeful that the new vial will work better for you. Please keep me updated about the results with this vial, and let me know if you have any questions or need anything else from me.